The night between 12th and 13th of April 2016 was going to be the last observing not for me in season 2015-2016. During that night, I was observing in Ulvila observatory, and during the night I observed 5 galaxies in constellation of Canes venatici. After having completed this session, my total amount of completed and published observations from this season is exactly 100. During this last night sthere was no snow on the ground anymore, but on the other hand, nights are already very short and darkness comes late. The observing conditions were roughly on a good average level in terms of Ulvila observatory, NELM 5.3 and SQM ~20.2-20.4. A small, faint galaxy, that is elongated in NE-SW direction, almost stellar. NGC 5273 observed with 11” catadioptric. A small, but pretty bright galaxy, the galaxy has rather stellar but faint core. The galaxy brightens towards the core. The galaxy is slightly oval shaped, and it’s long axis is in NE-SW direction. Easy one! NGC 4800 observed with 11” catadioptric. A small, pretty bright, oval -shaped galaxy, long axis in N-S direction, the galaxy has a bright core. Pretty easy! NGC 4143 observed with 11” catadioptric. A small and thin edge-on galaxy, the galaxy has almost stellar core, easy! NGC 4111 observed with 11” catadioptric. A small, rather faint and thin galaxy, elongated in E-W direction, the galaxy has rather bright core. NGC 4346 observed with 11” catadioptric. During my fourth and last night of observing on Mt. Teide, I was observing 5 objects in the constellation of Puppis. During the night it was very windy, and I was tired. Because of combination of these two factors, I didn’t felt motivated to start observing, but nevertheless I was able to motivate myself, and I’m glad I made those 5 observations during the night. During the night I measured lowest SQM readings during my trip, at lowest it was as low as 21.05. This is still a good reading especially in terms of Finland, but in terms of Teide it is a lowered reading. I din’t know reason for this, but actually it could have been caused by dust on my SQM -meter. Before leaving, I wiped off some dust from the sensonr of the SMQ -meter, and the reading jumped to 21.25. That is higher, but still considerably lower than the best readings I usually had during previous nights. A pretty large and bright starred cluster, not very concentrated but it is still well detached. In the middle of this cluster, there is a bright-starred triangle, the star in the upper right corner if this triangle is intensively red! NGC 2477 was visible as a nebulous patch 1,5 degrees east from the cluster. NGC 2451 observed with 3” refractor. an open cluster, that is elongated in NW-SE -direction. The cluster is rather faint-starred. It is not very concentrated, and it is moderately detached from it’s background. NGC 2546 observed with 3” refractor. A rather faint, roundish open cluster+nebula. The cluster itself wasn’t much visible, but the nebula was easy and obvious. The nebula was already weakly visible without OIII filter, but with the filter it became visible very well. NGC 2467 observed with 3” refractor. A small, faint-starred cluster. The cluster is moderately detached and -concentrated. NGC 2571 observed with 3” refractor. A small, faint and compact cluster, well concentrated and detached. NGC 2567 observed with 3” refractor. So, that was my fourth and last night observing of my 2nd Tenerife observing trip! During the trip, I made in total 31 observations during four nights. Objects that I observed, Included fro example Messier 68 and 83, NGC 5128, 5139, 2477, 3372 and 2237+2244. During the trip I was also able to spot the northernmost part of the Southern Cross and I also spotted alpha Centauri, which is the nearest stur to us after Sun. I also finished observing Messier catalogue and photographed the Milky way. I was doing all of my observations in the same spot every night. The spot was called El Retamar, and it located just outside the caldera in the SW side of the caldera. That was because I had already noticed, that the sky won’t get much darker deeper in the caldera so it doesn’t pay off to drive further, it just takes more time and there is more traffic interference. Observing conditions were good during every night, it was clear during all of my observing nights, but this time it was often very windy. The wind was sometimes very strong, and that was causing problems for my observing attemtps. After this observing trip I still have 28 Caldwell objects and 20 Hidden Treasures -objects to be observed. Besides that, I still have to observe objects between -62 to -90 from somewhere in southern hemisphere. But that’s going to be hopefully a new trip sometimes in future. The night between 7th and 8th of April 2016 was my third observing night during my second trip to Tenerife. During the night, I was observing again in the same site than during the previous nights. During the night, it was calm in the beginning, but towards the end of the session the wind started rising again. I was surprised that I was able to see The Carina nebula at all from the horizon of Teide! Of course, it was at very low altitude, and only the brightest parts of the nebula were visible. I was able to see two or three separate parts of the nebula. The brightes part appeared as large and bright, triangle -shaped nebulosity, which was already weakly visible without OIII filter, but it becomes well visible with the filter. The long axis of this part of the nebula is in N-S orientation, the tip of the triangle is pointing towards north. in the southern side of the triangle, there is another relativey bright nebulosity. In the W side, there appears to be very weak nebulosity. NGC 3372 observed with 3” refractor. A small, compact and bright-starred copen cluster, very beautiful! NGC 3293 observed with 3” refractor. Very large, bright and rich cluster! The cluster is elongated in shape (long axis in W-E direction). The cluster has pretty even brightness range. The cluster is well detached and somewhat concentrated. The stars weem to be quite faint (may be caused by low altitude), but still this is pretty impressive sight. NGC 3532 observed with 3” refractor. Very large and faint, ring-shaoed nebula (NGC 2237) surrounding open cluster NGC 2244. The westernmost half of the nebula is most obvious one, other parts are fainter. The nebula becomes visible with OIII filter and averted vision. NGC 2237, 2244 observed with 3” refractor. A rather small, pretty faint-starred and compact open cluster. NGC 3228 observed with 3” refractor. A very faint, edge on galaxy, long axis in NW-SE direction, no structure visible. NGC 3621 observed with 3” refractor. A small, faint edge on-galaxy, the galaxy has a pretty bright core, best visible with averted vision. NGC 5102 observed with 3” refractor. So, this was my third observing night on Mt. Teide during my second observing trip. During the second night of observing during my 2. trip to Tenerife, I woke up at 2am and drove up to Mt. Teide to observe the morning sky and Milky way! I arrived at my observing place around 3am, and it was very, very windy up the mountain! The wind was very gusty, on-off wind, at times it was totally calm but soon another gust came and I had to hold on all the papers to prevent wind from throwing them all over! That was quite problematic! Even though the wind was a nuisance, I was still able to make 6 visual observations and to take some wide angle photos of the Milky way! NGC 5662 observed with 3” refractor. Large and very beatiful and rich open cluster, the cluster is well concentrated and well detached from it’s background. NGC 6124 observed with 3” refractor. Pretty bright globular cluster, not resolved but it brightens slightly towards the core. Easy! NGC 5986 observed with 3” refractor. Large, bright globuar cluster, not resolved, brightens slightly towards the core. NGC 6397 observed with 3” refractor. Very small and compact cluster, easily overlooked with this kind of RTF -telescope. NGC 6193 observed with 3” refractor. NGC 6352 observed with 3” refractor. Milky way is best visible in the morning in this time of the year. I had taken my camera (Canon EOS 1100D) and couple of wide angle lenses with me to Tenerife and I also bought one of those gorilla pods for a small miniature travel tripod. I supported the camera+8mm Samyang fish eye -lens+gorillapod -combination on some rocks on the ground and took some shots of the Milky way. I think the Milky way was stunning, but it is easy to see some light pollution from the tourist areas of Los Cristianos-Las Americas in the lower part of the photo. 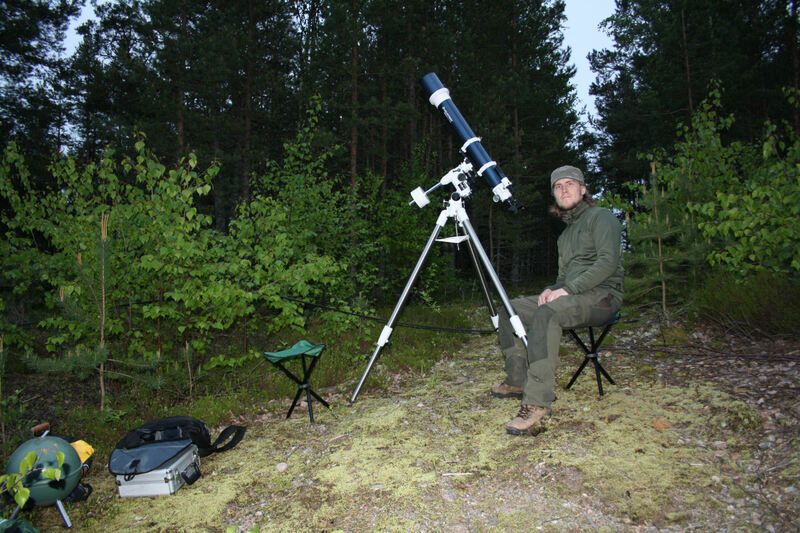 From that photo you can also get some general idea about my observing place. It is a place that has practically zero horizon to the south, only some isolated trees are rising to few degrees, but they aren’t blocking the view and it is easy to move the telescope to get a clear view. Milky way photographed in the morning of 6th of April with Canon EOS 1100D and Samyang 8mm fish eye -lens. Exposure time: 30s. During my first observing night of my 2nd Tenerife observing trip, I was able to observe in really good conditions and calm weather on Mt. Teide! I also had very productive observing session that night, I made 13 observations in total! So this time it was mostly calm, and temperature was comfortably 8 to 4 C -degrees above zero! This time I had decided that I won’t drive further to the caldera, because the conditions don’t seem to differ much when compared with the outer parts of the caldera. During this 2nd observing trip, I stayed every night at my El Retamar observing site just outside the actual caldera in the SW side of the caldera, just at the border of the national park. That place was closest good observing spot for me from my hotel. In this place I had a zero horizon to south and car headlights were disturbing as little as possible. A small, pretty bright globular cluster, the cluster gets clearly brighter towards the core, the cluster is not resolved into stars. NGC 1851 observed with 3” refractor. A rather small, compact and pretty faint open cluster, the cluster is well detached and concentrated towards the center. The cluster appears to be rich, the cluster is mostly visible as a starglow. NGC 2477 observed with 3” refractor. Large, beautiful and bright-starred cluster, moderately rich, well detached, not very concentrated. IC 2391 observed with 3” refractor. A planetary nebula, that appears to be a rather large one, because I was able to see it non-stellar with this small aperture instrument. The nebula was visible as a small, non-stellar bright disk. NGC 3132 observed with 3” refractor. Large, bright globular cluster, not resolved, gets slightly brighter towards the core. NGC 3201 observed with 3” refractor. Large and bright globular cluster, not resolved, brightens towards the core. Messier 68 observed with 3” refractor. Messier 83 observed with 3” refractor. Large, pretty faint galaxy, a little bit oval shaped (long axis in SW-NE direction), the dark dust lane was quite weakly visible with averted vision. NGC 5128 observed with 3” refractor. Very large and very bright globular cluster! The cluster is not resolved, but it appears weakly granular. The cluster brightens slightly towards the core. The object was an easy naked eye -sight, and it was stunning already through the finderscope! Really magnificent object! NGC 5139 observed with 3” refractor. Very faint and thin edge on galaxy (long axis in W-E direction), the galaxy is visible weakly with averted vision and sweeping. NGC 4945 observed with 3” refractor. A small and pretty faint globular cluster, brightens towards the core, not resolved. The Jewelbox cluster! The cluster was very weakly visible because of very low altitude, but to my surprise, I was at least able to see the cluster from horizon of Teide! Only the brightest stars of the cluster were visible. NGC 4755 observed with 3” refractor. NGC 5694 observed with 3” refractor. So, that was my first night of observing during my 2nd Teide observing trip! After having finished observing, I still was admiring the beauty of the southern skies before heading down to my hotel for a sleep.